The Coventry Town Hall is located on Portage Lakes Drive behind the Fire Department and Administrative Offices. This building is generally used for personal, civic and governmental uses. 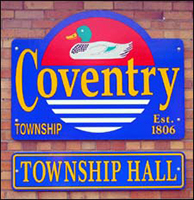 The Coventry Township Town Hall will not be used for any commercial or business use. PAYMENT AND DEPOSIT DUE WITHIN SEVEN (7) DAYS OF RESERVING HALL. NO alcoholic beverages, NO smoking, NO gambling and NO Disc Jockeys allowed. NOTHING shall be taped, pinned, or affixed to any fixture in the Town Hall, this includes the walls, ceiling, Plexiglas, and windows. NOTHING shall be taped, pinned, or affixed to the bare tables and chairs. All renters of the Town Hall will be responsible for clean-up after use by doing the following OR a clean-up fee of $60.00 will be assessed and future user privileges could be revoked. 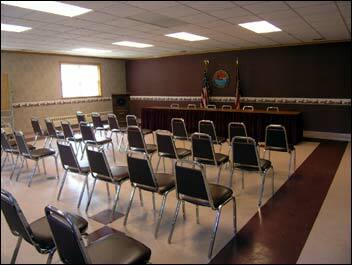 ALL folding chairs shall be placed folded and upright in the chair rack in the back corner of the Town Hall. *NO chairs are to be removed from the hall. All tables are to be cleaned after use – 4 tables can remain upright; please return 2 to the side wall by the windows, and the other 2 to each side of the main table. Remaining tables are to be folded and placed upright in the table rack. NO tables are to be removed from the hall. Restrooms must be left in clean condition and trash removed, especially baby diapers. ALL damages to the Town Hall or its contents therein, shall be charged for accordingly. ALL COMMUNITY GROUPS AND RENTERS OF THE TOWN HALL ARE RESPONSIBLE FOR CLEAN-UP AFTER EACH USE. PLEASE BE SURE THE TOWN HALL IS IN “READY CONDITION FOR THE NEXT GROUP OR INDIVIDUALS. THIS HALL IS VERY HEAVILY USED, AND REQUIRES THE FULL COOPERATION OF ALL USERS. ANYONE LEAVING THIS BUILDING IN UNACCEPTABLE CONDITION WILL HAVE THE RENTAL AND/OR USER PRIVILEGES REVOKED. THE FOLLOWING IS REQUIRED, OTHERWISE A CLEAN-UP FEE OF $100.00 WILL BE ASSESSED.